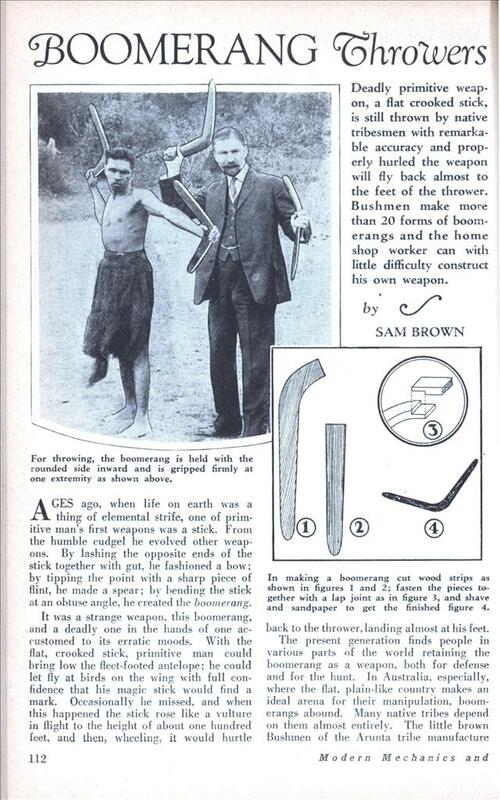 Deadly primitive weapon, a flat crooked stick, is still thrown by native tribesmen with remarkable accuracy and properly hurled the weapon will fly back almost to the feet of the thrower. Bushmen make more than 20 forms of boomerangs and the home shop worker can with little difficulty construct his own weapon. AGES ago, when life on earth was a thing of elemental strife, one of primitive man’s first weapons was a stick. From the humble cudgel he evolved other weapons. By lashing the opposite ends of the stick together with gut. he fashioned a bow; by tipping the point with a sharp piece of flint, he made a spear; by bending the stick at an obtuse angle, he created the boomerang. It was a strange weapon, this boomerang, and a deadly one in the hands of one accustomed to its erratic moods. With the flat, crooked stick, primitive man could bring low the fleet-footed antelope; he could let fly at birds on the wing with full confidence that his magic stick would find a mark. Occasionally he missed, and when this happened the stick rose like a vulture in flight to the height of about one hundred feet, and then, wheeling, it would hurtle back to the thrower, landing almost at his feet. The present generation finds people in various parts of the world retaining the boomerang as a weapon, both for defense and for the hunt. In Australia, especially, where the flat, plain-like country makes an ideal arena for their manipulation, boomerangs abound. Many native tribes depend on them almost entirely. The little brown Bushmen of the Arunta tribe manufacture no less than twenty forms of boomerangs, ranging all the way from a fourteen inch bird stick to the heavy, four foot war boomerang. The average boomerang as used by the Australians is in the shape of an obtuse triangle, flat on one side and convex on the other, measuring about two and one-half feet from tip to tip. The brown men use acacia wood in their construction; yours can be fashioned from a piece of straight-grained and well-seasoned hickory or ash, about 2 feet long by 5 inches wide and % inches thick. From this board cut out a piece of the shape shown in figure 1. This is, roughly, 19 inches long from the tip to the center of the bend, and tapers from 2-1/4 inches wide at the center to 1-3/4 inches at the end. Cut a second piece like that shown in figure 2. Fasten the two pieces together with a lap joint, as shown in figure 3, using plenty of good glue and two or three small brads. In nailing the two pieces together, you must confine yourself to a narrow strip down the center, so that the brads will not interfere with the final step in making the boomerang. This consists in rounding one of the sides. Do this with a sharp knife or spoke shave, keeping the center portion of the boomerang the original 3/8 inch thick, and shaving the edges down to about 1/8 inch thick. After roughly fashioning this convex surface with your knife, take a rough grade sandpaper and finish the job. Once the wood has been smoothed to your satisfaction, insert the final brads in the joint and give the whole thing a coat of varnish. Your finished boomerang should look like figure 4. In throwing the boomerang, the missile is held with the rounded side inwards—to the left side of a right hand thrower. It is gripped firmly at one extremity and thrown away with a straight overhand jerk of the arm, spinning so rapidly that it is practically reduced to a circular plate of wood of a diameter equal to a line joining the two ends. Skimming swiftly to the point of object and meeting no obstacle, it will rise like a bird seeking a place to alight, until it has risen a hundred feet or more, and then, wavering for a moment, it will turn and come swooping back toward the thrower. The boomerang is invariably thrown against the wind. It is against the wind only that the magic stick is self-retrieving. The parabolic flight of the boomerang is a beautiful thing to witness. Although the slick leaves the thrower’s hand in an almost vertical plane, it gradually changes to approximately horizontal, then swerving to the left, it soars skyward and then volplanes back to the ground again. 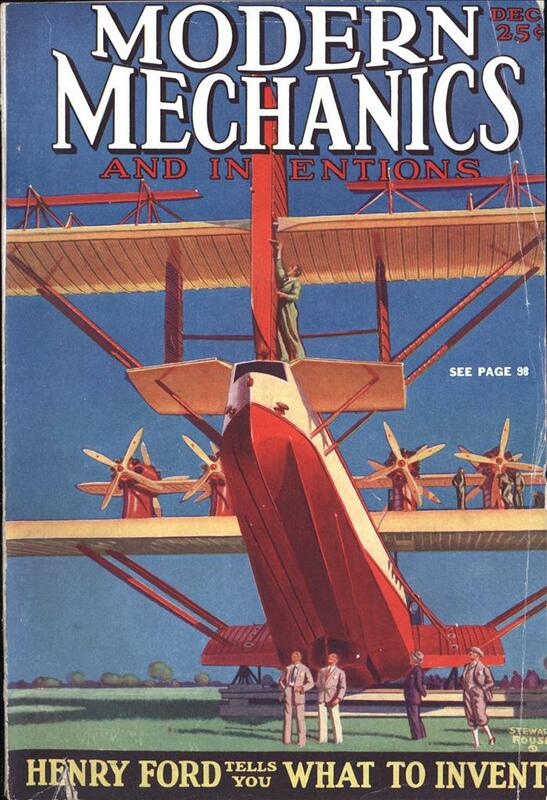 Some idea of the flight on a Lilliputian scale can be gained by sailing a midget model. Make this from a piece of very stiff paper or thin card, about 3 inches long and crescent shaped. In propelling this tiny boomerang, it is balanced on the extended left forefinger and snapped with the forefinger of the right hand.